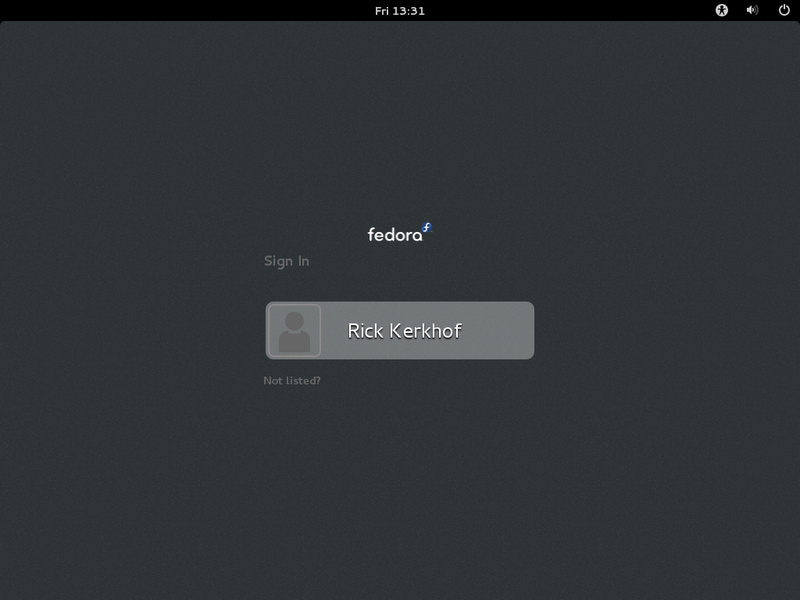 As I haven't tried Fedora in a while, decided to give V18 a go. 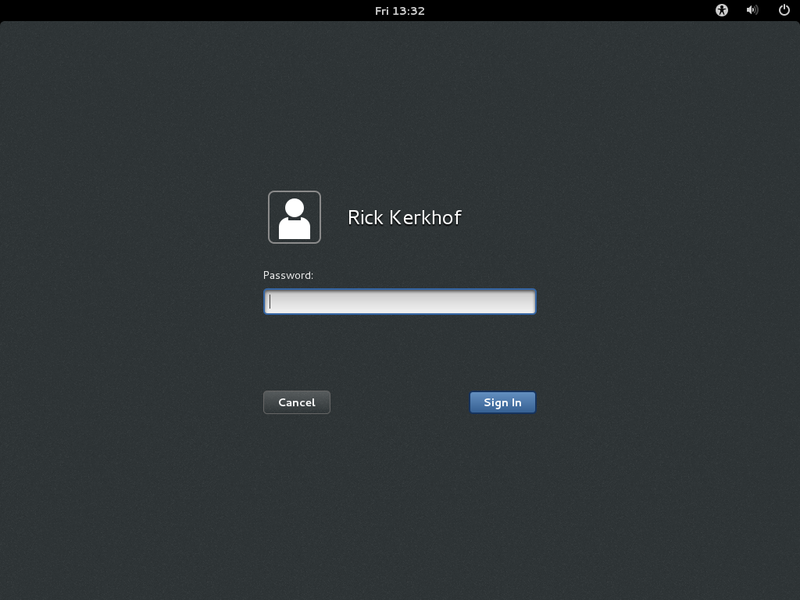 I downloaded the 64-bit version of the GNOME 3 desktop variant, and booted it up in VirtualBox. As with any OS, it has to be installed. 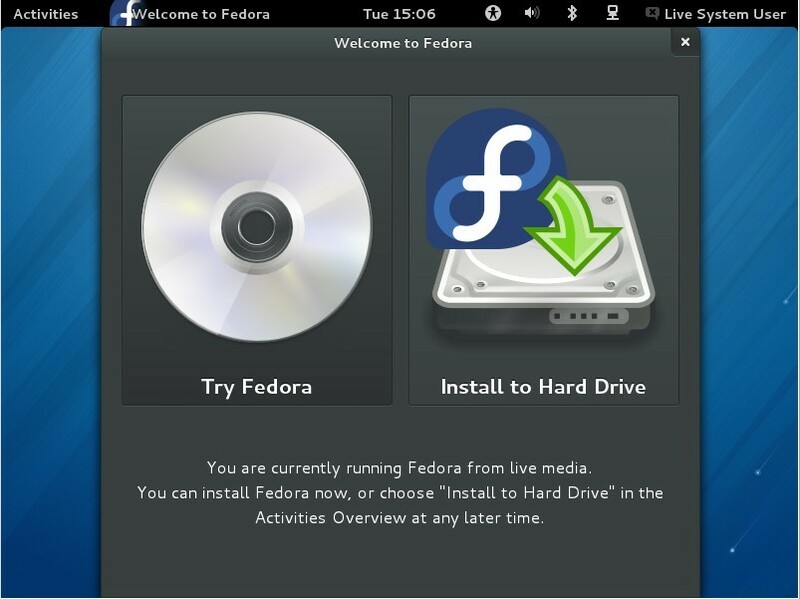 One of the first things you notice when booting the live CD, is that you get presented with two choices: Try Fedora or Install to Hard Disk. For now, I chose Install. The window closes and it seems to do nothing, but then the installer finally appears. My first thought was "What a slick interface! ", it has the main installer components. I left everything as it was, and clicked the only option which needed attention; the installation destination. Again, a slick interface. 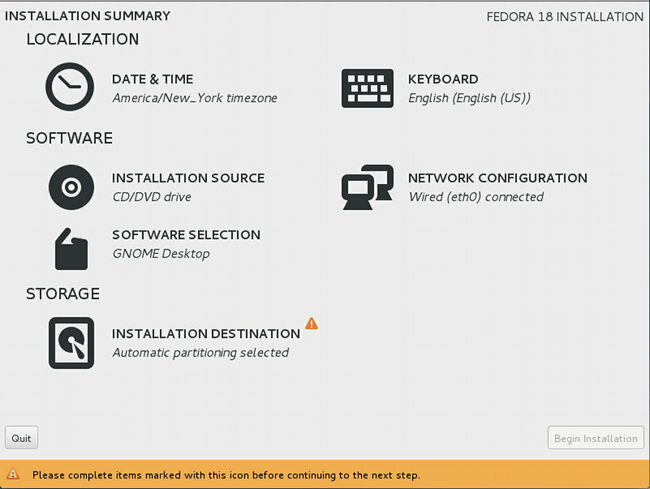 Select where you want to install Fedora and click Done, can't get any simpler. I selected the only HDD I saw, VBOX HDD, and clicked Done. When I came back at the "home screen" (lets just call it that, since it more or less resembles what the screen is), it still marked the HDD part as needing attention - but it went away after a couple of settings. The only thing it wants me to do is set a root password, which I did. While setting the password the installer continued it's job in the background. It warned me that the password was too weak, but since this is a test environment I'm skipping over that and clicked the Done button again (it requires you to click it twice if you want to accept a weak password). After the installation was done, it asked me to quit the installer. Clicking Quit just closes the installer and does nothing more. As the installer suggested me to do, I rebooted the system. Rebooting the system, there are a couple of interesting things I see. First, GRUB 2 has been restyled to fit Fedora's style. On the first boot, I am presented with a configuration utility. It allows me to create a user, much like the other distros do, nothing really special. After creating the user, I am presented with a login screen. 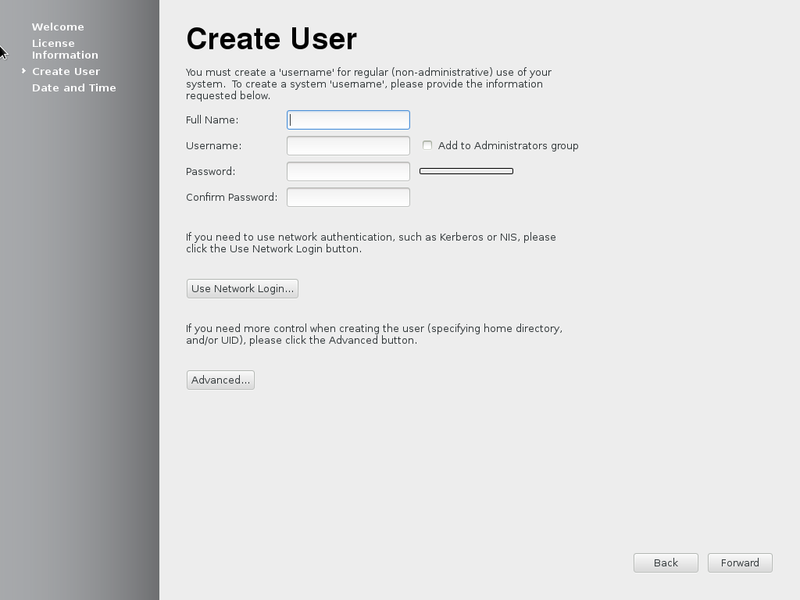 Nothing too fancy, GNOME 3 default (GDM-based). Not to say it looks extremely pretty, in my opinion. Logged in, and it loaded the desktop. 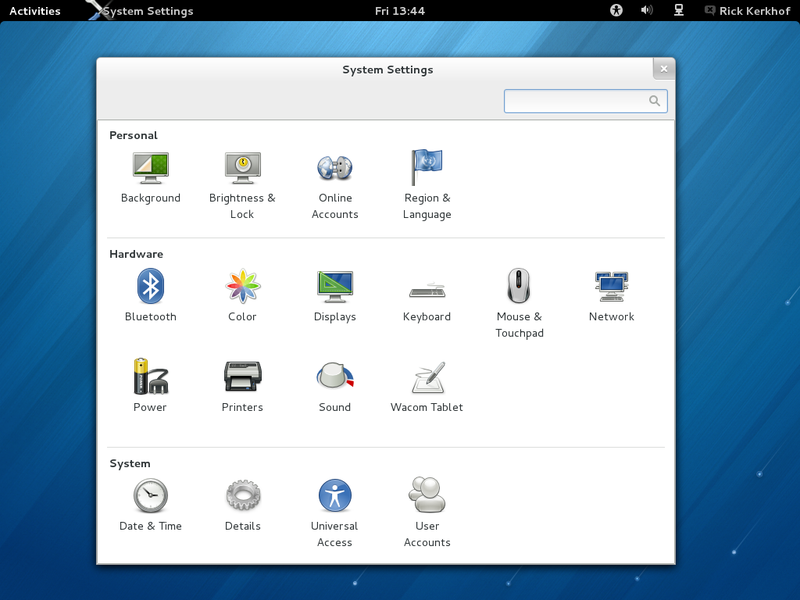 It is the standard GNOME 3 desktop, with the Activities panel at the top. 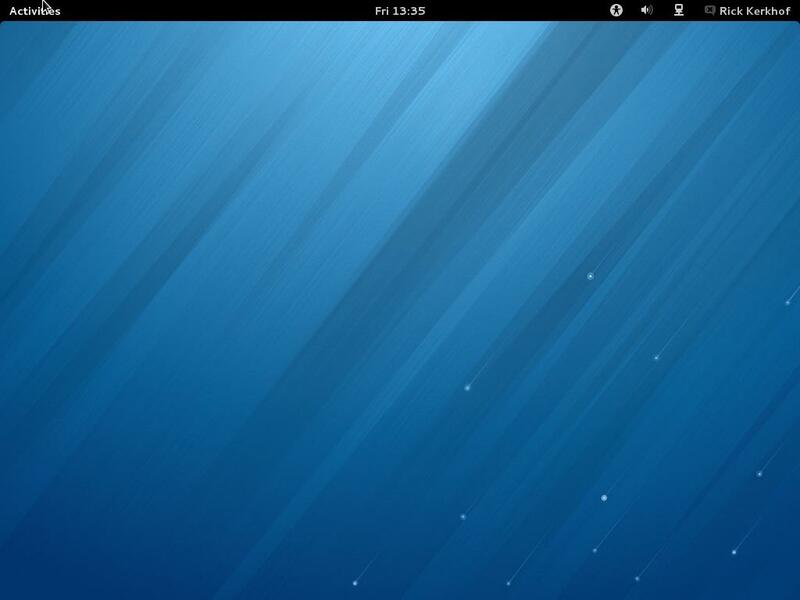 There are other desktops available for Fedora, too. 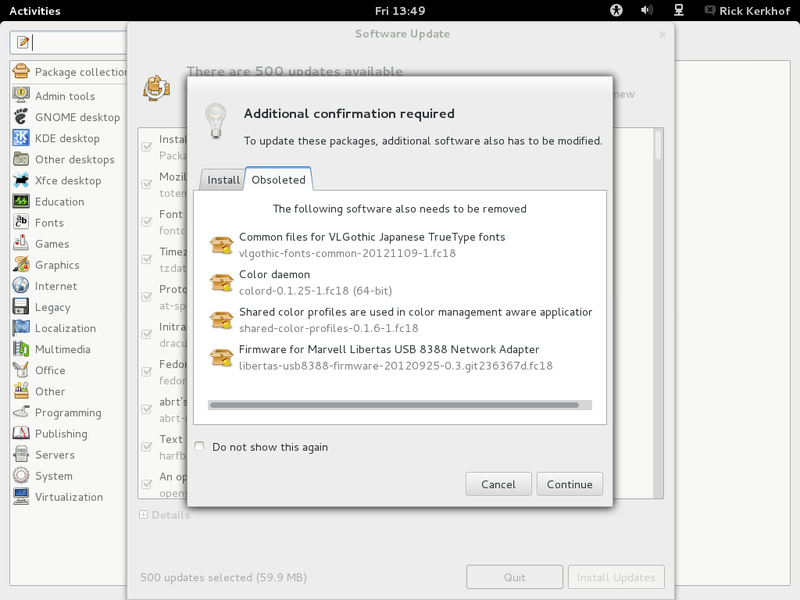 I picked the GNOME 3 version, so I got GNOME 3. I'm not going to spend too much time here, as the desktop is pretty much standard. 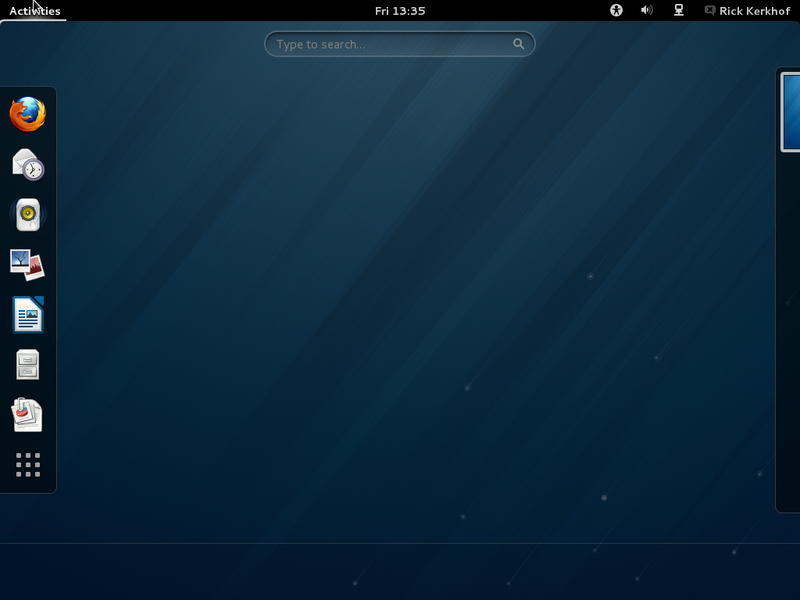 One interesting choice is the default browser; Firefox as opposite of the standard Web of GNOME 3. I can see where they are coming from though since most users are used to Firefox or another popular browser, and the not-so-well-known Web may be a tad overwhelming to them due to the lack of features. 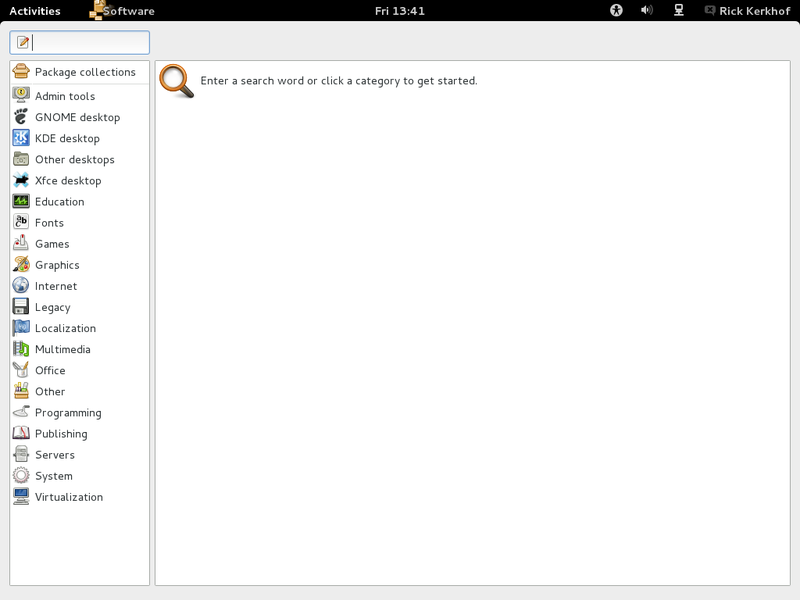 Other default apps include Evolution (mail and agenda client), Rhythmbox (music player and organiser), Shotwell (photo manager), LibreOffice (office suite, much like MS Office), Transmission (BitTorrent client) and more of the standard GNOME apps like Empathy for chatting, gedit for text documents and the like. 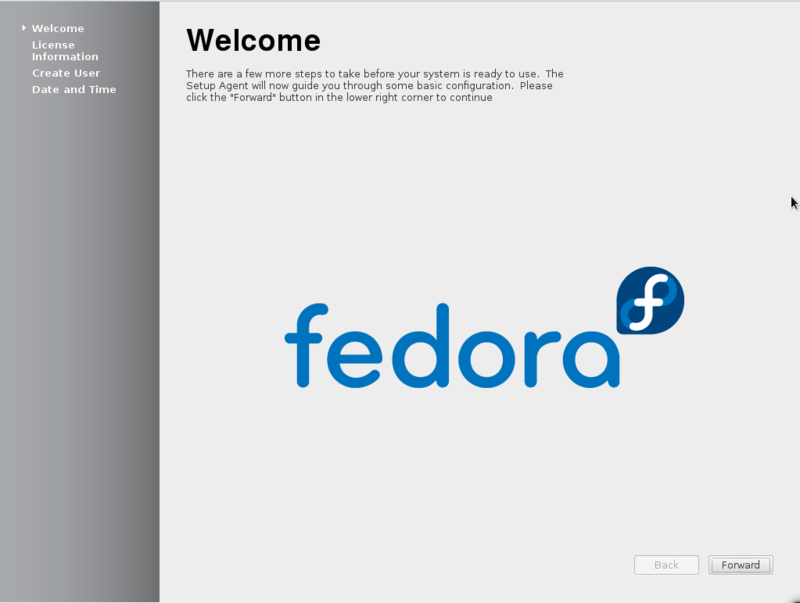 Fedora in VirtualBox feels sluggish without the guest additions installed. Time to take care of that. For this, the first thing I dive into is System Settings. Looking for a Hardware panel of some sorts, I can't seem to find it. So searching for the next thing to find the Guest Additions; a software center. I found Software, which looked like a Software Center to me. I am greeted by a straightforward interface. It tells you what to do and is pretty nice-looking too. While I was at it, I went to check for updates. After a bit of searching I found the Check for Updates button in the menu on the top bar. After a fresh install, 500 updates looked reasonable to me. The size looked too small to me, though, but I went ahead and installed the updates. It notified me of additions and removals. One of the things I like about these small features is that there are no packages clugging your system. With Ubuntu and the like you need to manually run "sudo apt-get autoremove", but with Fedora with the YUM backend there is no need to, apparently. The Update Manager just did its job, nothing more. It updated my system safely, the process was painful and easy. Anyone could do it, but that is pretty much standard in update managers in distros. While it was running, I continued my search to the guest additions. Except that I couldn't - the update manager was first in the yum queue, so the Software app waited for it to complete. This is something apt-get does too, and I am not blaming either of them for it. Bad things could happen if two packages were installed at the same time. After the update manager was finished, I searched for the guest additions again. Without much luck, it looks like they aren't in the repositories. That's too bad - lets do it the manual way. Fedora Current ISO's should help to avoid hundreds of updates. The ISO's you are pointing to are not daily ISOs. Did you find any ? kinda like one button shopping. What is the "RTM" release ? RTM stands for Release To Manufacturers, but it really is the final release without any updates. So you have to update it yourself. The ISO's there are fully updated. We could have one very easily. I would just have to add a menu providing just a link point to a LinuxVillage directory where I would put all our ISO's together. (The ones built on Debian and the ones build on Ubuntu). This will also mean change all the links pointing to it in the forum. Is it necessary ? ISO of one of many ISO's, and can see a list of all available ISO's in one place. Sounds good to me, and not having to look thru several forums to find an ISO. Done and thank you for pointing to the need. You can read here.